In this heartwarming comedy from director Garry Marshall, Helen Harris (Kate Hudson) is living the life she always dreamed of. Her career at a top Manhattan modeling agency is on the rise; she spends her days at fashion shows and her nights at the city's hottest clubs. But her carefree lifestyle comes to a screeching halt when one phone call changes everything. Helen soon finds herself responsible for her sister's children - 15-year-old Audrey (Hayden Panettiere), 10-year-old Henry (Spencer Breslin), and 5-year-old Sarah (Abigail Breslin). No one doubts that Helen is the coolest aunt in New York, but what does this glamour girl know about raising kids? The fun begins as Helen goes through the transformation from super hip to super mom, but she quickly finds that dancing at 3 a.m. doesn't mix with getting kids to school on time, advice that Helen's older sister, Jenny (Joan Cusack), is only too quick to dish out. Along the way, Helen finds support in the most unusual place with Dan Parker (John Corbett), the handsome young pastor and principal of the kids' new school, and realizes the choice she has to make is between the life she's always loved and the new loves of her life. $14.239 million on 2717 screens. Will Garry Marshall ever direct a successful movie that doesn’t star Julia Roberts or someone who looks like her? Perhaps, but it appears that whenever Marshall works with leading ladies other than Roberts or Anne Hathaway, his movies flop. Add 2004’s Raising Helen to the list of bombs, as it brought in a mere $37 million. For this effort, Marshall goes with blonde Kate Hudson as his lead actress. She plays Helen, the assistant to Dominique (Helen Mirren), the owner of a hot modeling agency. She lives a party-filled lifestyle in the Big Apple while her sisters Jenny (Joan Cusack) and Lindsay (Felicity Huffman) tend to their families in suburban New Jersey. 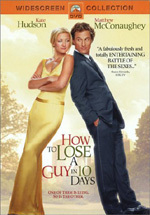 Things change when Lindsay and her husband Paul (Sean O’Bryan) die in a car accident. This leaves their three kids Audrey (Hayden Panettiere), Henry (Spencer Breslin), and Sarah (Abigail Breslin). To the surprise of both surviving sisters, Lindsay and Paul leave custody of the children to Helen instead of the much more motherly Jenny. Against - and partly due to - Jenny’s objections, Helen decides to care for the kids, which leads her to move the trio into Manhattan with her. Unsurprisingly, many life-altering adjustments follow. Helen needs a bigger apartment, which necessitates a move to a much less chi-chi neighborhood than her prior digs. She struggles to find a new school for the tykes, but apparent divine intervention leads them to Saint Barbara’s, a Lutheran school. Helen strikes lightning twice, as not only does she get them into the school but also she meets hunky Pastor Dan Parker (John Corbett), the cool and handsome leader of the establishment. The rest of the movie views the various challenges. Helen tries to manage her fast-paced career with the rigors of handling the kids. She also develops a low-key romance with Pastor Dan. Haven’t we seen this movie already? Shake a tree and 10 flicks about unqualified caretakers who find it hard to adjust but end up with a happy, loving brood will fall onto the ground. They should have simply titled the movie Helen and the Great Exploding Inevitable, as not a single unpredictable moment occurs. The movie suffers from the simplistic tone Marshall lends to it. Each kid gets one and exactly one very basic problem that we need to solve. Audrey tries to run with a fast crowd and shows the usual teen rebellion, while Henry deals with death by obsessing on the topic. Sarah can’t come to terms with it and regresses to a less mature state. The film represents these issues with easy icons that the movie wraps up tidily by the end. Nothing more complex ever emerges during Helen, and the film never quite decides what tone it wants to take. Marshall seems like he might want to make something a little more serious, but he falls back on his extensive sitcom background pretty heavily. The director consistently undercuts potentially dramatic elements with goofy humor. It feels like he doesn’t trust his turn toward deeper material and goes back to what he knows. Basically this makes Helen a 10 cent version of trauma viewed in a sitcom manner. Occasionally Marshall lets us see greater depth, such as the understated and moving scene in which Helen learns of her sister’s death. The movie needed more scenes like that and fewer cute musical montages; the film teems with those. At least the cast helps redeem the material. Hudson tries to give her underwritten role more depth, and the presence of solid pros like Cusack and Mirren adds personality and pizzazz to the flick. On the negative side, do we need a cameo from Paris Hilton? If anything will date the flick, it’s her bony presence. Ultimately, Raising Helen had potential to be something interesting. However, it became mired in overdone subject matter that lacked any depth. It relied on a superficial tone and cutesy comedic moments. Those weren’t usually funny, so without anything else to back up the material, the film turned into an overly long and fairly dull piece of work. Raising Helen appears in an aspect ratio of approximately 1.85:1 on this single-sided, double-layered DVD; the image has been enhanced for 16X9 televisions. The picture looked good but not anything special. Sharpness mostly appeared fine. Some light softness interfered with wider shots, but nothing heavy marred the presentation. For the most part, the flick seemed acceptably concise and distinctive. Jagged edges and shimmering weren’t an issue, but I saw some light to moderate edge enhancement caused more haloes than I’d like. As for source flaws, I saw no issues like specks or grit, as the flick looked clean. Helen used a natural palette that presented nice colors. The tones consistently came across as warm and vivid. No problems with bleeding or noise occurred, as the hues were tight and lively. Blacks also came across as deep and dense, and shadows were fairly clean and smooth, though a couple of low-light shots were slightly muddy. The transfer fell short of greatness, but the movie mostly presented a good image. The Dolby Digital 5.1 soundtrack of Raising Helen also seemed acceptable but unspectacular. The soundfield maintained a modest scope. The vast majority of the audio concentrated on the forward channels, and the stereo imaging of the score presented the most prominent elements. Most of the effects stayed with general ambience, as little about Jersey opened up the mix in an active way. As for the surrounds, they kicked in with minor environmental information and that was about it; they didn’t work too hard. For the most part, audio quality appeared positive. Speech came across as natural and distinctive, as I noticed no edginess or other problems. Effects were a small factor but consistently seemed clean and accurate. Music fared nicely, with tight highs and firm lows. The audio of Helen generally satisfied but that was about it. As for supplements, we find a few on Helen. The most significant one comes from an audio commentary with director Garry Marshall and writers Beth Rigazio, Jack Amiel and Michael Begler. All four sit together for this running, screen-specific piece. I very much enjoyed Marshall’s prior commentaries, so I looked forward to this one. Though usually a group dynamic makes a track livelier, the writers actually slow Marshall down a little, as he seems to work better on his own. Nonetheless, we get a pretty good discussion of the flick. Even with three writers in tow, Marshall heavily dominates the commentary, though script-related topics come to the forefront. We get a lot of information about inspirations and influences for the story as well as changes between the script and the screen. For the most part, the commentary remains anecdotal in nature. Marshall chats about the actors and the atmosphere on the set, with many remarks about experiences there. Marshall also tells us about his theories on editing, pacing, and other story-telling elements. It’s not one of Marshall’s best commentaries, but it still comes across as lively and informative. Next we find a four-minute and 44-second Blooper Reel. It’s the usual wackiness and goofs. After this we see a music video for Liz Phair’s “Extraordinary”. It mostly consists of lip-synch footage, though it also occasionally puts Liz in the movie’s action. She looks pretty good, but the song and video are pretty forgettable otherwise. We get six deleted scenes. These run a total of 13 minutes and 49 seconds. We get a little bit more that sets up the Tinka character as well as additional moments in which Helen tries to adapt to her new situation. Some of these show her post-family interactions with her old friends from the modeling world. They’re not bad, at least not compared to the rest of the flick. The final piece is actually an outtake that probably would have made more sense in the blooper reel. Marshall provides remarks before and after each snippet to let us know a little about them and why they got the boot. He proves amusing and informative as usual. The disc opens with some ads. We get previews for Mulan and National Treasure. These also appear in the Sneak Peeks area with trailers for The Young Black Stallion, Felicity, Popular, Around the World in 80 Days Season Three and Hope & Faith. A predictable take on an overdone subject, you won’t find anything fresh or new in Raising Helen. A good cast makes the ordinary material more palatable, but not by much, as it remains without great charm. The DVD presents decent but unspectacular picture and audio along with minor extras highlighted by a pretty interesting commentary. Skip this bland piece of fluff.